In most homes, the kitchen sees more traffic than any other room in the house. We cook and eat meals there, kids do homework there. And when we entertain, many people gravitate to where the food is … the kitchen. With all these activities happening in the kitchen, we're storing a lot of stuff there. 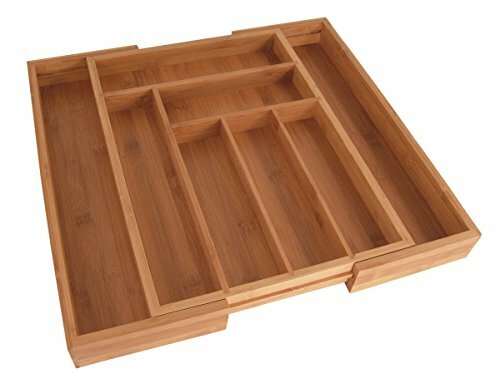 This means the kitchen needs great kitchen drawer organizers to store everything. Recognizing the need for kitchen drawers to be organized, there were many manufacturers at the 2017 Kitchen and Bath Show (KBIS) with new organizing solutions for the kitchen. As we share photos of the many organizers for your kitchen drawers (they're also moving into the bathroom), there are a few things to consider. Will you first assess the kitchen drawers and stuff that needs organizing help? Will you buy new organizing gadgets and rearrange stuff to use them effectively? Will you step back and identify activity centers in your kitchen, and rearrange stuff to save you time? Many organizing fanatics like myself, tend to use the second organizing approach. We enjoy rearranging our stuff every time we find a new gadget. Manufacturers love it because we keep buying more organizing gadgets, and admittedly, some of them never get used. At last year's home show I discovered Organize My Drawer (my organized kitchen junk drawer above). They offered me one drawer if I would share my experience with you. At the beginning it felt like the organizing addict's dream come true. Designing this drawer was a lot harder than I expected. To share my experience, I wrote a series of articles plus two videos on How to Organize Your Kitchen Drawers. What I learned was if you spend more time reviewing what you've stuffed into your drawers and what you don't need, you'll stay organized a lot (read LOT) longer. It took a few weeks for my husband to return the scissors to my kitchen junk drawer above. It's worth it though, because after a year, the drawer is just as organized as the day I put it together. 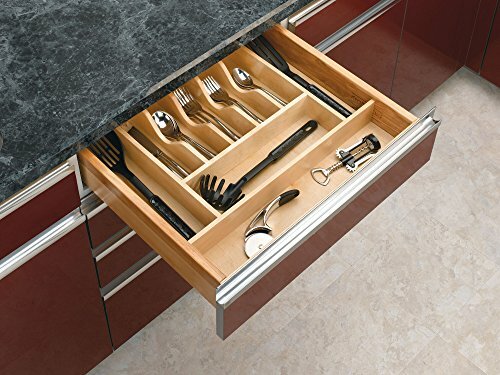 Now that you're thinking about this differently, there are a few other points to consider as you go about picking organizing solutions for your kitchen drawers. Materials – vary from flexible rubber to hard plastics, metal, wood and bamboo organizers (the green solution) have become very popular. Fixed versus adjustable solutions – is another factor to consider as you're likely to buy a new pot somewhere in the future. You might even get that magical KitchenAid mixer you've always dreamed about, and need to organize the attachments that come with it. Combination organizers – where you get canisters for things like pasta, sugar and flour, that fit into holders so they don't bank around as you open and close kitchen drawers. 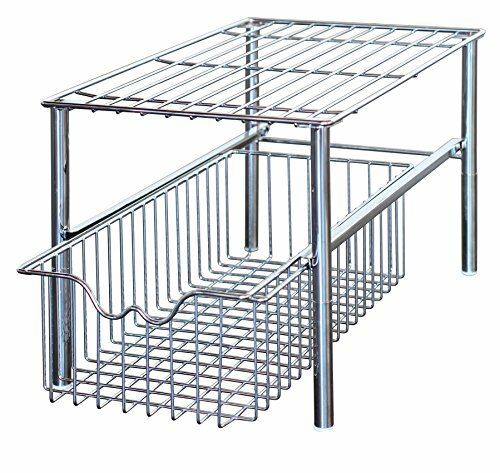 Which Kitchen Drawer Organizer Do You Like Best? So here were the organizing solutions I found for kitchen drawers this year. Can't wait to learn which ones you like best so leave a comment below. What else belongs in the silverware drawer? Things like salt and pepper that also go on the table. Want to free up more counter space? Here's what is moving into drawers and cabinets. Love this idea because I'm not a fan of cluttered counter tops. You might say they're a hot button of mine. 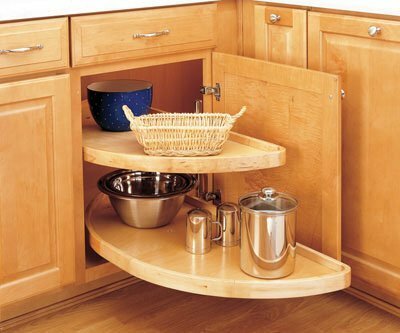 Are your corner cabinets working for you? 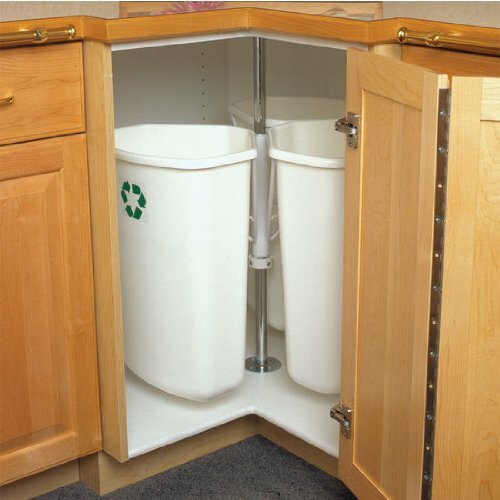 Love the ones that pull out for easy reach, and would love to work the rotating recyling center bins below into my kitchen. 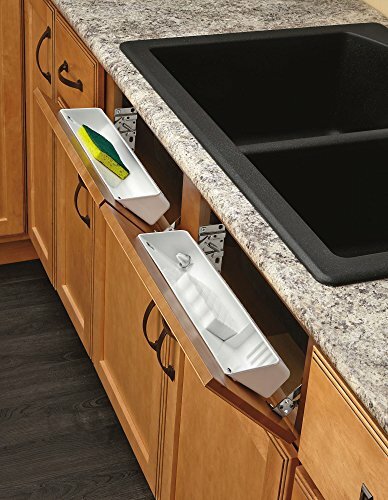 Happy with how you're using the space under the kitchen sink? 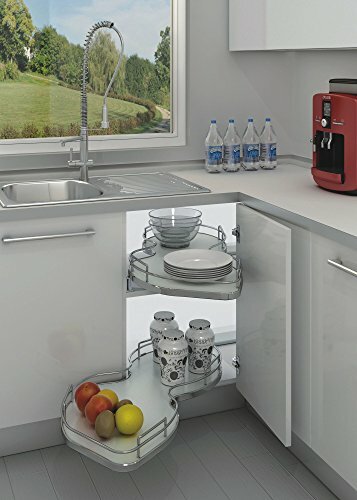 What I liked most was their pull-out kitchen cleaning caddy that otherwise lives under the sink. You can't really see this in my photo so check it out on the Hardware Resources website. Grabbing a cookie sheet is always a stretch. They're either tucked in the cabinet over the refrigerator so you need a chair to get them, or they're packed so tight in a skinny cabinet that you end up pulling them all out. So love this new sliding cabinet that makes it so much easier! 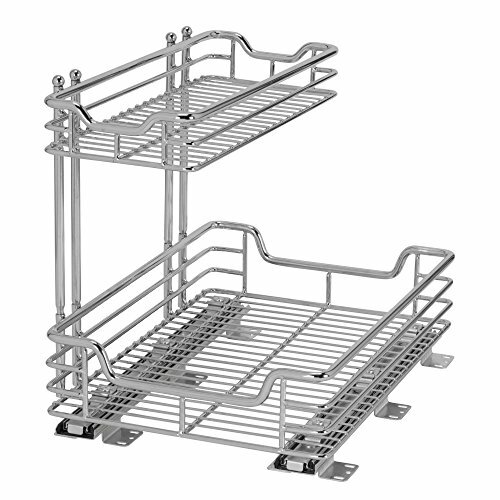 Which of these kitchen drawer organizers do you like best? 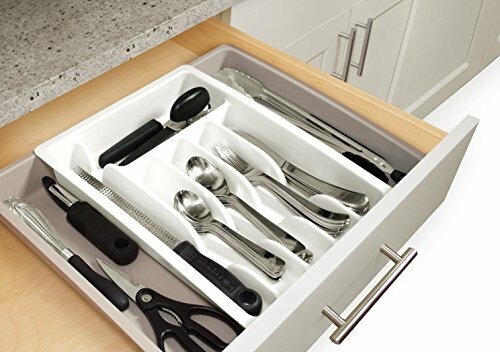 I want, I want the pull-out drawer that holds the Oxo canisters!!! I am actually designing my new kitchen tomorrow and I’m taking that photo with me! Talk about perfect timing!! !